How to train for a half marathon as a new mum in 4 weeks. New mums, you probably think it's impossible but you couldn't be more wrong. People want to believe they’re invincible. New mums included. They want to believe they can conquer anything. And why shouldn’t they? They’ve been through labour, people. Let’s just remember that. They’ve brought a new life in to the world. But that doesn’t mean their achievements have to stop there. And comedian Claire Hooper, 38, is a prime example. The stand up comic and new mother has recently completed her first half marathon just eight months after giving birth to her daughter, Penelope. 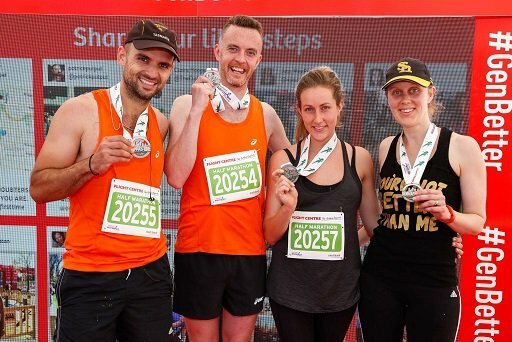 After just four weeks of training in between work and juggling mum duties, the Aussie personality completed a 21 kilometre race for the Medibank Melbourne Running Festival this year. When asked why she decided to do it, she said it was all someone else’s idea. “I must have been having a good day because I remember thinking it sounded like a fun challenge. I then spent four weeks of training cursing my optimism…A month and a half before the race I was literally doing zero exercise. 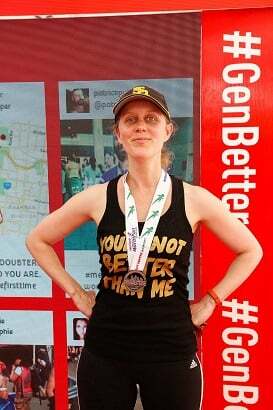 Well, ok, I’d run once in the six months since having Penny,” she said. Claire doesn’t lie about the fact that fitting training into a ‘new mum’ schedule is hard. Really hard. “It’s really, really difficult,” she said. It’s hard because her husband also works and he’s already tired and not interested in getting up an hour earlier so she can spend some time running around in the sunshine with her dog. “He’d like to be with the dog too,” she said. 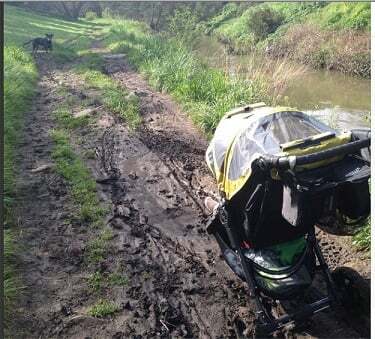 Claire got bogged during a run with her baby and dog. The former Good News Week panellist jokes at her husband’s expense, explaining that the funny part was that he’d signed up for a half marathon too a month earlier but they both couldn’t fit their exercise in. “Lucky for me, unlucky for him, he hurt his calf and couldn’t go ahead with his. Poor guy,” she said. Ultimately Claire said her baby wasn’t happy sitting for an hour watching mum do squats so she had to pay for a babysitter while continuing to train. It meant she could leave her baby at home while she focussed on getting her body marathon ready. After one night of really bad sleep due to a snotty, unhappy baby, Claire ran the furthest she’d ever run, and was thankful she could leave her baby at home. “I guess the lesson is that for a new mum there’s no better motivation than wanting to get as far as possible away from the crying,” she said. Claire admits that she was lucky with her work timetable – because comedy shows are at night, she could fit training in around that. Even so, she also confesses that she needed a lot of help to prepare for a marathon in four weeks. “I was put in touch with a pretty wonderful trainer (Becky Locking) whose strategy was to exhaust my legs with squats and lunges and then make me practice running when I didn’t feel like I could move my legs anymore. Practice running the last 5ks, as she put it…On the day though, I guess it’s the energy of the crowd, I found it a breeze. Truly,” she said. Although Claire had only run 11km before race day, she got in ‘the zone’ during the event and managed to complete 21 kilometres. “I enjoyed feeling like one tiny part of a huge moving mass. I started a little bit late so got to overtake a lot of people, never mind that they were twice my age or overcoming illness to be there, it still made me feel good about myself,” she said. And crossing the finish line was everything she’d been led to believe. She felt like she floated the last 50 metres from pure exhilaration. It was a feat that many mums probably believe to be impossible. Get advice from your doctor and if possible a trainer as well, because the joints are all still so stretchy, post-baby. Just aim to finish. Or set a very, very safe goal so it’s easy to beat. On the day of the race start at the back of the pack so that you get to overtake a few people, it worked magic on my confidence levels. Oh, and be strategic about stopping for a wee. I queued at a single stall toilet for ten minutes and that ten got added on to my time. I could’ve made my dad even more proud! We created a program that Claire would enjoy, not find a chore. For a long race like a 21km marathon, the personal training sessions were focused on strengthening the muscles that surround the joints used when running to prevent injury. No specific meal plan was created, rather a long list of healthy options she could choose from. Sticking to a set meal plan isn’t right for everyone and Claire is busy with work and her family. These meals consisted of lean protein to help her recover and repair her muscles, and complex carbohydrates to ensure she had the energy to get through her training program and maintain her busy lifestyle. New mums should also check with their doctor before starting exercise to get the all clear first. As a new mum your joints are much looser because of the hormone relaxant that occurs during pregnancy. So you need to check that you are ready to start exercising again. My tips to new mums getting back into fitness? Look after your mental health. Don’t expect crazy results too quickly. Try and join a mother’s exercise group that has a crèche, or better still, involves the babies in the workout. – The Hockeyroos have made it in to the semi-finals of the Championship Trophy in Mendoza, Argentina. They secured their spot after beating Japan with a very convincing 4-1 win this week. It’s the first time they’ve made it in to the top four since 2009. – The World Rugby Women’s Sevens Series started on Thursday in Dubai with the focus on qualifying for the Olympics. The top four teams at the end of the series will secure their spot in the Rio 2016 Olympic Games. Good luck to our girls. – Ric Charlesworth was appointed as the Australian Womensport and Recreation Association’s new ambassador on Thursday and he took the reigns immediately. He called for a change to the public’s attitude toward women’s sport and said there needs to be a top-down change from the boardroom to the playing fields – if Australia’s sportswomen are to get a fairer deal. So mums and non-mums – what do you think about training up to do a half-marathon?